I started roasting my own beans almost four years ago. A client of mine had been roasting his for a while and being a devote of fine drink, I picked his brain for some ideas and his methods. I got a basic roaster from Invalsa on Ebay…If I remember right it was about $80 and came with a couple pounds of green coffee beans. Most people don’t know how stale the grocery store coffee really is until they try a cup of truly fresh roasted. The model roaster I got was the “Fresh Roast 8” and it has been replaced with the SR300 which has a few improvements and now runs just over a $100. People ask, Why spend $100 for a roaster? I answer with 2 primary reasons…Cost and Taste. I can get Fair Trade Organic Green Coffee Beans of great quality for less than $5 a pound…I’ve spent up to $6.50 and as little as $3.50…The variety is great and the freshness is unparalleled. Our super market sells stale old bulk coffee from a specialty roaster for about $11 a pound. The little packages of Starbuck’s (the evil mermaid in some coffee circles) run about $13 a pound. Yesterday, I ordered 25 pounds from three different growers, via Sweet Maria’s…25 pounds delivered for $5.22 a pound. This lot should last us about 3-4 months. The prices and service at Sweet Maria’s are great, and they have about 60-70 different kinds of beans available. You can get green beans from a lot of suppliers online, you can also find some from high-end coffee shops or local roasters. 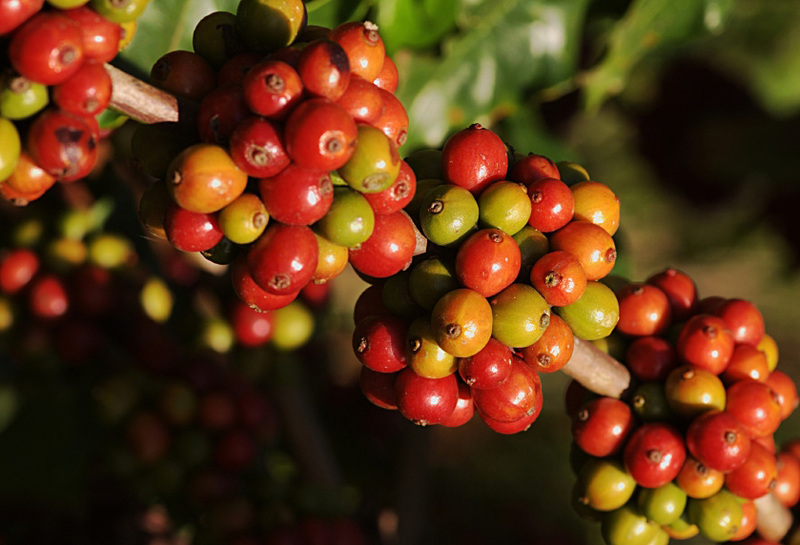 High end coffee is a bit like fine wine, with different growing regions and processes bringing different flavor profiles. Yes, I have turned into a coffee connoisseur, or snob, as the less informed might say. But each morning, I am treated to a fine cup. One of the benefits of getting the beans green is they have a very long shelf life. Six months to a year of green bean storage, has little effect on the final roasted product. Roasted coffee flavor peaks at 12-24 hours after roasting, and after a week, its pretty dull. I roast every day, and use the beans the next day. When we have guests I may roast 2-3 batches. Each batch roasts in about 5-6 minutes. Larger roasters may take 15-20 per batch. You don’t need a fancy roaster to get started, you can roast in the oven, on the stove top, or even with an old “air popper” for popcorn. Before I became enlightened with fresh roasted, I thought dark was good, the darker the better. A lot of commercial roasters use this darker roast to mask inferior beans. By roasting every day we can switch subtle flavor profiles with minor changes in the roast. Mostly we roast to Full City, or Full City +. You can read about, and see the different levels of roasting at this great page at Sweet Maria’s. We drink lattes, and cappuccinos mostly, and we make these with our Giotto. I got my machine on E-bay for about half of the retail price you see listed here. Mine is the older version built by the original company ECM. These are now made by Rocket Espresso, a prosumer line spin-off from ECM. I replaced a couple gaskets and gave mine a minor tune-up. The guy I got it from said it was not performing well, he bought a newer machine rather than getting this one fixed up. With the new gaskets and tune-up, it has been running like a champ. I got the gaskets for less than 10 bucks, and with my engineering skills the install was painless. With a coffee-house latte running $3.50 to $4.00, This thing paid for itself within the first 6 months we owned it. We make two to five a day. One or two each and sometimes three for me. Our rare afternoon pickup is normally just an espresso. As it is in poor taste, per Italian culture, to add milk after 11. We call these “shooters” and sometimes might add a dash of heavy cream, if we have some. These cream shooters, of course, are truly decadent. One of the keys to great espresso is a great grinder, the basic blade mill does not yield a uniform grind. We use a conical burr mill, when we roast up a batch for camping or for the cabin we grind coarse for use in the french press. The grind for espresso is quite fine. 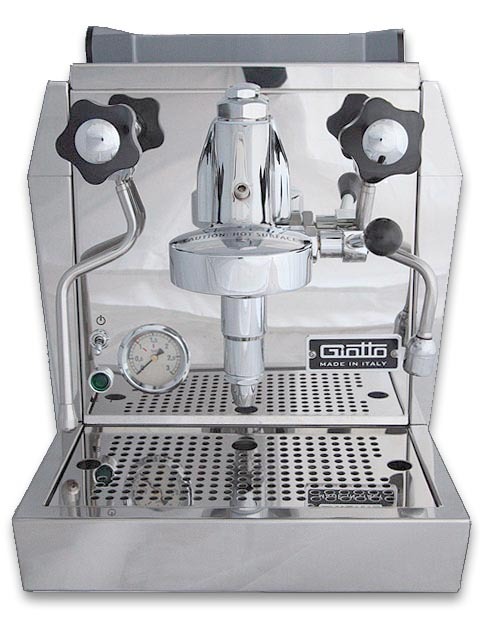 If you want to experience great coffee…the first thing you should do is get a really good grinder. Ours is a Solis Maestro, and we have been very happy with it. Our “House” drink is a Maple Cappuccino or know here as a “cap”. It starts with a dash of real maple syrup in the bottom of the cup. (We buy grade B syrup in bulk at Whole Foods) In next is a rich, crema heavy, double shot of espresso, then the foamed milk (we use mostly 1%). Sometimes we dress them up with some etching (chocolate syrup art in the foamed milk)…more on that in a later post. We also have a few bottles of Torani Syrups, for Hazelnut, Vanilla, or Caramel additions. The Real Maple Syrup though, is our hands down favorite, the other syrups have a slight “synthetic” type of edge to them, and detract from the base of the fresh roasted. After all, Why have great beans only to add and alter nature’s perfection with artificial flavors? The girls however seem to like the syrups in milk as a variation to the Nesquick.